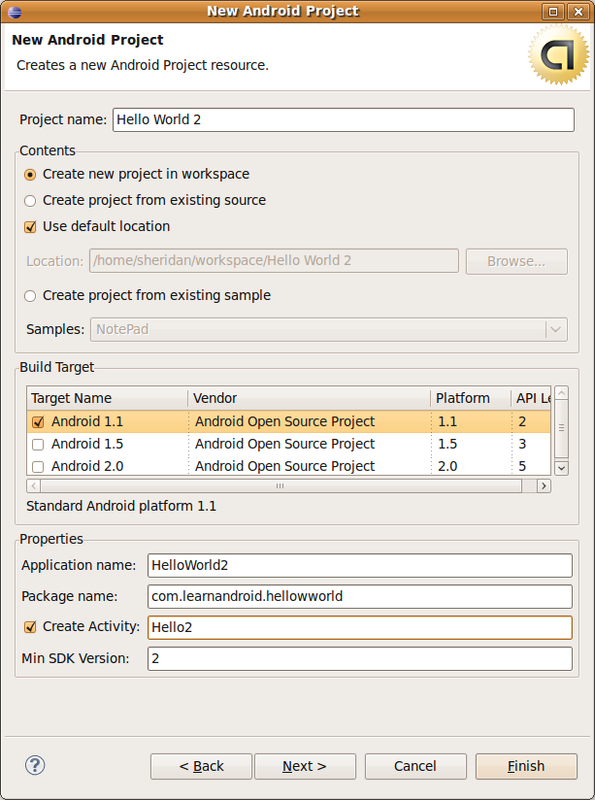 This is part 2 of a multipart series that looks at some basic Android I/O using some simple Hello World programs. If you haven’t already read it you should probably start with Part 1. For this part we are going to create a new project with these settings. 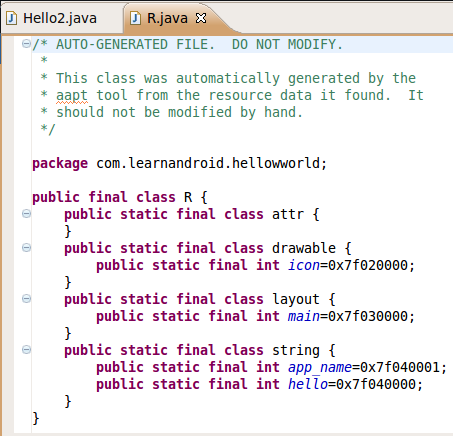 The default Hello2.java will look very similar to the default Hello.java from Part 1. This time, however, we are going to find out more about the line setContentView(R.layout.main); In the first example we used setContentView to render our TextView to the screen. 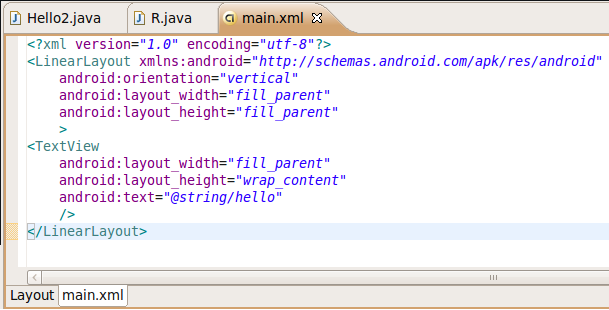 By default, however, Android is designed to use XML files to setup your UI. In addition to the src folder, which holds the source code intended to be edited by the developer, there is a gen folder and a res folder. The gen folder holds automatically generated code. If you open this folder and expand the namespace you should see R.java. We’ll come back to R.java in a moment. Before we open that file, lets also expand the contents of the res folder. The res folder holds resources for your android app. By default you should see three folders in here, drawable (which holds an android icon), layout (which contains main.xml), and values (which contains strings.xml). If you open main.xml and click on the main.xml tab you should see the XML that provides your activity its layout. so android:text=”@string/hello” will get this value and place it in the TextView that is displayed to the user. Let’s go ahead and change the value to our simple “Hello World” now. Go ahead and save your change and close both strings.xml and main.xml. At this point you are probably wondering how Android gets the information from the XML files and uses them in your program. Go back to the gen folder and open R.java and we’ll see the answer. When R.Java is generated it creates a class for each resource type (drawable, layout, and string) and variables in each class providing access to your resources. so R.layout.main actually maps to your main.xml file via this R Class and the layout inner class. If you don’t exactly understand what is going on here don’t worry. Just remember that R will let you access items in your res folder so the line. tells android to use the layout in your main.xml file in res/layout. Since we edited the value in string.xml we should be able to run this program and see our “Hello World” displayed. Before we move on to part three, let’s modify this program a little bit to show how to access a View element (such as our TextView) in our code. Posted by Sheridan on Thursday, November 19, 2009, at 9:51 pm. Filed under Beginner, I/O. Tagged android 1.1, Beginner. Follow any responses to this post with its comments RSS feed. You can post a comment or trackback from your blog. Great ! this post is very useful . I will follow your blog. hey nice explanation of the Layouts. I really understood layouts better than what I understood from Google docs for Android layouts. obsolutely excellent acticle and tutorial for beginner, clear and coherent. the best i have seen.